It’s that time of year to review how the Tahoe City, California real estate market has performed for the first four months of 2013. Here is the Tahoe City, California homes for sale Market Report for the January 1, 2013 through April 30, 2013 period. Sold Sales: Tahoe City area had 20 single family homes sold for the first four months of 2013. 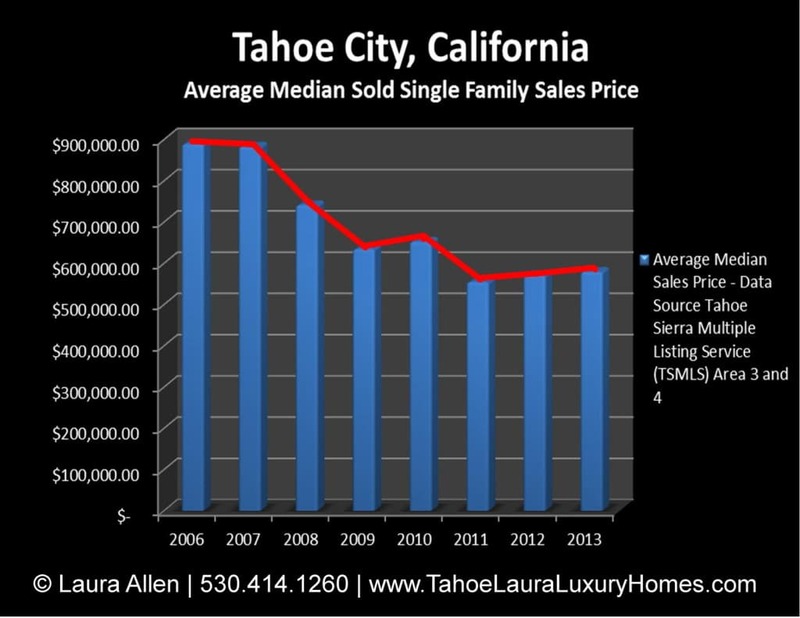 The Tahoe City single family home sales price has remained flat in 2013 with a slight 1% increase with an average median homes sales price of $580,000 compared to the entire 2013 year. The current absence of any distressed home sellers in the Tahoe City market is good news for sellers and price stabilization should continue in 2013. The median average days on market was 83 DOM. Cash Sale Transactions: The number of cash sale transactions for the Tahoe City area has declined to 25%, which 1 out of every 4 home sold in the Tahoe City area was a cash buyer. Absorption Rate: The current single family home absorption rate for the Tahoe City area is at 7.8 months, which indicates a Buyers’ market dancing with becoming a Balanced Market as of 05/03/2013. Distress Sales: Distress sellers (bank foreclosures- Real Estate Owned (REO’s) and short sales) decreased to 15% of all homes sold in 2013, which is a primary reason for the market improvement in the Tahoe City area. With the absence of short sales and REO/Bank Foreclosures no longer dominating the Tahoe City market, we can expect prices to stabilize and move up. Active Homes for Sale in Tahoe City: There are thirty-nine (39) Active– available homes for sale in the Tahoe City area as of 05/03/2013. They ranged in price from $299,000 to $16,800,000, with an average median asking sales price of $897,500. The current inventory levels for the Tahoe City area are extremely limited. Of the thirty-nine (39) homes offered for sale, there are none (Zero – 0) short sales, and no (Zero – 0) REO (Bank Foreclosure) listings, – 0% of the current listings are distressed, which is a clear sign that the Tahoe City market has stabilized and has turned around. Pending Home Sales: There are eleven (11) pending home sales in the Tahoe City area and they range in price from $329,000 to $7,950,000. There is one (1) short sales, and one (1) REO/Bank Foreclosure. If you’d like more information on the Tahoe City area, or would like to know what your Tahoe City area home, cabin, or lakefront property may be worth, call Laura Allen at 530.414.1260. The Tahoe City community is located at the junction of Highway 89 South and Highway 28. The commercial downtown area of Tahoe City is located along Highway 28, on the North Shore of Lake Tahoe. As you pass over the Truckee River outlet, you’ll still be in Tahoe City, but you’re now on the West Shore of Lake Tahoe. The Tahoe City area has some neighborhoods that are walking distance to the public beaches, and the downtown area. Tahoe City also has several neighborhoods which have properties that offer good lake views like Talmont, Tahoe Woods, Panorama Estates, The Highlands, and Dollar Point. Tahoe City is a great place to spend the day, and during the summer months you’ll find a local Farmers’ market (Thursday mornings), free movies at Commons Beach (Wednesday evenings), and free music concerts also at Commons Beach (Sunday afternoon). If you’re looking for a great central North Lake Tahoe location that is close to Truckee, Homewood, Alpine Meadows, Squaw Valley, and all of the wonderful amenities that the greater Lake Tahoe area has to offer, check out the Tahoe City community! Real estate market conditions are improving for homes for sale in the Tahoe City area.